It is ideal to make codling moth management a neighbourhood project, because your trees can be infested by moths from your neighbour’s trees, despite your own best efforts at keeping populations of this pest down. This is the same reason OKSIR is an area-wide program and urban residents and rural farmers must work together for codling moth control in the valleys. What if my neighbour isn’t taking care of their fruit trees? If you believe that your neighbour is not taking care of their codling moth host trees, then please contact the SIR Program and provide us with the address of the property, what kind of fruit trees they have, how many fruit trees they have, and why you believe they are not being taken care of (e.g., tree not pruned, infested fruit on tree, rotting fruit on ground, etc.). Our staff will inspect the property for signs of codling moth infestation and advise the owner of their responsibilities in managing their host trees. Your information will be kept confidential, and we will follow up with you if requested to do so. My neighbour has codling moths. How do I keep my trees safe? Unfortunately, codling moths will not stay in your neighbour’s backyard; they will likely come into your trees too. The best thing to do is to maintain your tree by following a strict management plan which combines a variety of non-chemical and chemical methods of controlling the codling moth. Can SIR make my neighbour take care of or cut down their trees? It is a priority to work with homeowners on preventing and clearing codling moth infestations. If a codling moth infestation is found, SIR is able to enforce certain control methods to clear an infestation. This is usually done by having the property owner remove all of the fruit from the tree(s), typically for a couple years or more. By removing the fruit, when the moths emerge after winter and mate the resulting larvae will not have a food source to survive and continue the cycle. If trees continue to be in an infested state, and an owner is not willing to manage the tree, then SIR has the ability to enforce removal of host trees as a last resort. We always encourage host tree owners to maintain their trees regularly by implementing a variety of control methods such as pruning to a manageable height, thinning fruit clusters, spraying, removing blossoms and fruit, inspecting and properly disposing of infested fruit, or removing their trees if they no longer wish to take care of them. If there is no infestation, however, we do not force people to strip or cut down their trees. © 2019 Okanagan-Kootenay Sterile Insect Release Program. The Sterile Insect Release (SIR) Program is an area wide environmentally friendly approach to managing the codling moth population in the Okanagan, Similkameen and Shuswap Valleys. 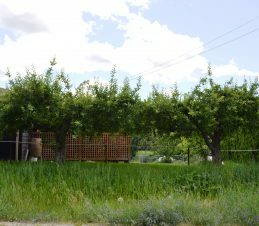 The program’s emphasis is on raising and releasing sterile moths into commercial orchards to disrupt the codling moth mating process.